National Security Advisor Susan Rice addresses the situation in Syria at the New America Foundation in Washington. Photo by Nicholas Kamm/ AFP/ Getty Images. Good afternoon, everyone. Thank you, Anne-Marie, for your kind words and for the invitation to be here today. And thank you for your principled leadership — both in government, where we worked together so closely, and now at the New America Foundation. I want to commend you and your colleagues here for the many contributions you make to our national security discourse — including on the challenge that brings us together today. In response to Bashar al-Assad’s barbaric use of chemical weapons against the Syrian people, President Obama, after careful consideration, has decided that it is in the national security interest of the United States to conduct limited military strikes against the Syrian regime. President Obama has asked Congress for its support in this action, because in a democracy, our policies are stronger, more effective and more sustainable when they have the support of the American people and their elected leaders. Tomorrow evening, the President will address the nation and make his case for taking action. Today, I want to take this opportunity to explain why Syria’s use of chemical weapons is a serious threat to our national security, and why it is in our national interest to undertake limited military action to deter future use. There is no denying what happened on August 21. Around 2:30 in the morning, while most of Damascus was still asleep, Assad’s forces loaded warheads filled with deadly chemicals onto rockets and launched them into suburbs controlled or contested by opposition forces. They unleashed hellish chaos and terror on a massive scale. Innocent civilians were jolted awake, choking on poison. Some never woke up at all. In the end, more than 1400 were dead — more than 400 of them children. In recent days, we’ve been shocked by the videos from Ghouta and other neighborhoods near Damascus. As a parent, I cannot look at those pictures — those little children laying on the ground, their eyes glassy, their bodies twitching — and not think of my own two kids. I can only imagine the agony of those parents in Damascus. Sarin is odorless and colorless, so victims may not even know they have been exposed until it is too late. Sarin targets the body’s central nervous system, making every breath a struggle and causing foaming at the nose and mouth, intense nausea and uncontrollable convulsions. The death of any innocent, in Syria or around the world, is a tragedy, whether by bullet or landmine or poisonous gas. But chemical weapons are different. They are wholly indiscriminate. Gas plumes shift and spread without warning. The masses of people they can fell are immense. The torturous death they bring is unconscionable. Chemical weapons, like other weapons of mass destruction, kill on a scope and scale that is entirely different from conventional weapons. Opening the door to their use anywhere threatens the United States and our personnel everywhere. There is no doubt about who is responsible for this attack. The Syrian regime possesses one of the largest stockpiles of chemical weapons in the world. Assad has been struggling to clear these very neighborhoods in Damascus and drive out the opposition, but his conventional arsenal was not working well enough or fast enough. Only the Syrian regime has the capacity to deliver chemical weapons on a scale to cause the devastation we saw in Damascus. The opposition does not. The rockets were fired from territory controlled by the regime. The rockets landed in territory controlled or contested by the opposition. And the intelligence we’ve gathered reveals senior officials planning the attack and then, afterwards, plotting to cover up the evidence by destroying the area with shelling. Of course, this is not the first time that Assad has used chemical weapons in this conflict; we assess that he has used them on a small-scale multiple times since March. But August 21 was very different. Whereas previous attacks each killed relatively few people, this one murdered well over a thousand in one fell swoop. Assad is lowering his threshold for use while increasing exponentially the lethality of his attacks. Assad’s escalating use of chemical weapons threatens the national security of the United States. And the likelihood that, left unchecked, Assad will continue to use these weapons again and again takes the Syrian conflict to an entirely new level — by terrorizing civilians, creating even greater refugee flows, and raising the risk that deadly chemicals would spill across borders into neighboring Turkey, Jordan, Lebanon, and Iraq. Obviously, the use of chemical weapons also directly threatens our closest ally in the region, Israel, where people once again have readied gas masks. Every time chemical weapons are moved, unloaded, and used on the battlefield, it raises the likelihood that these weapons will fall into the hands of terrorists active in Syria, including Assad’s ally Hezbollah and al Qaeda affiliates. That prospect puts Americans at risk of chemical attacks targeted at our soldiers and diplomats in the region and even potentially our citizens at home. Equally, every attack serves to unravel the long-established commitment of nations to renounce chemical weapons use. 189 countries, representing 98 percent of the world’s population, are party to the Chemical Weapons Convention, which prohibits the development, acquisition, or use of these weapons. The United States Senate approved that convention by an overwhelming, bipartisan majority, binding America to the global consensus and affirming that we do not tolerate the use or possession of chemical weapons. So, the Assad regime’s attack is not only a direct affront to that norm but also a threat to global security, including the security of the United States. Failing to respond to this outrage also threatens our national security. Failing to respond means more and more Syrians will die from Assad’s poisonous stockpiles. Failing to respond makes our allies and partners in the region tempting targets of Assad’s future attacks. Failing to respond increases the risk of violence and instability as citizens across the Middle East and North Africa continue to struggle for their universal rights. Failing to respond brings us closer to the day when terrorists might gain and use chemical weapons against Americans abroad and at home. Failing to respond damages the international principle reflected in two multilateral treaties and basic human decency that such weapons must never again be used anywhere in the world. Failing to respond to the use of chemical weapons risks opening the door to other weapons of mass destruction and emboldening the madmen who would use them. We cannot allow terrorists bent on destruction, or a nuclear North Korea, or an aspiring nuclear Iran to believe for one minute that we are shying away from our determination to back up our long-standing warnings. If we begin to erode the moral outrage of gassing children in their bed, we open ourselves up to even more fearsome consequences. Moreover, failing to respond to this brazen attack could indicate that the United States is not prepared to use the full range of tools necessary to keep our nation secure. Any President, Republican or Democrat, must have recourse to all elements of American power to design and implement our national security policy — whether diplomatic, economic, or military. Rejecting the limited military action that President Obama strongly supports would raise questions around the world as to whether the United States is truly prepared to employ the full range of its power to defend our national interests. America’s ability to rally coalitions and lead internationally could be undermined. Other global hotspots might flare up if belligerents believe the United States cannot be counted on to enforce the most basic and widely accepted international norms. Most disturbingly, it would send a perverse message to those who seek to use the world’s worst weapons – that you can use these weapons blatantly and get away with it. Now, I know that many Americans are horrified by the images from Damascus and are concerned about the devastating broader consequences. But, while they believe the world should “act,” they are not sure military action is the right tool at this time. Let me address this important argument. The reason President Obama decided to pursue limited strikes is that we and others have already exhausted a host of other measures aimed at changing Assad’s calculus and his willingness to use chemical weapons. As the August 21 mass casualty attack makes clear, these efforts have not succeeded. Since the beginning of the regime’s brutal violence against its own people more than two and a half years ago, we have consistently backed the United Nations diplomatic process and urged the parties to the negotiating table, fully cognizant that a political solution is the best way to end the civil conflict and the Syrian regime’s torment of its own people. We collaborated with our European allies to impose robust, comprehensive sanctions to pressure the Assad regime. We supported the creation of a United Nations Commission of Inquiry to document atrocities and deter perpetrators in Syria. When Assad started using chemical weapons on a small scale multiple times, we publicized compelling evidence of the regime’s use, sharing it with Congress, the United Nations, and the American public. At our urging, over months, Russia and Iran repeatedly reinforced our warning to Assad. For the last year, we admonished Syria directly. We all sent the same message again and again: don’t do it. But they did it, first on a small scale, in a manner hard for the world to discern. In response, we augmented our non-lethal assistance to the civilian opposition and expanded the nature and scope of our support to the Supreme Military Council. We pressed for more than six months to gain the United Nations investigation team unfettered access to Syria, on the logic that the presence of such a team in the country might deter future attacks. Or, if not, at a minimum, it could establish a shared evidentiary base that might finally compel Russia and Iran – itself a victim of Saddam Hussein’s monstrous chemical weapons attacks in 1987and1988 – to pull the plug on a regime that gasses its own people. But then, when UN investigators finally entered the country, the regime launched the largest chemical weapons attack in a quarter century while the inspectors staged on the other side of town. For five days thereafter, the regime stalled and shelled the affected areas to destroy critical evidence. So only after pursuing a wide range of non-military measures to prevent and halt chemical weapons use did President Obama conclude that a limited military strike is the right way to deter Assad from continuing to employ chemical weapons like any conventional weapon of war. The fact is, President Obama has consistently demonstrated his commitment to multilateral diplomacy. He would much prefer the backing of the United Nations Security Council to uphold the international ban against the use of chemical weapons, whether in the form of sanctions, accountability, or authorizing the use of force. But let’s be realistic — it’s just not going to happen now. Believe me, I know. I was there for all of those UN debates and negotiations on Syria. I lived it. And it was shameful. Three times the Security Council took up resolutions to condemn lesser violence by the Syrian regime. Three times we negotiated for weeks over the most watered-down language imaginable. And three times, Russia and China doubled vetoed almost meaningless resolutions. Similarly, in the past two months, Russia has blocked two resolutions condemning the use of chemical weapons that did not even ascribe blame to any party. Russia opposed two mere press statements expressing concern about their use. A week after the August 21 gas attack, the United Kingdom presented a resolution that included a referral of war crimes in Syria to the International Criminal Court, but again the Russians opposed it, as they have every form of accountability in Syria. For all these reasons, the President has concluded that it is in our national security interest to conduct limited strikes against the Assad regime. I want to take this opportunity to address concerns now that even limited strikes could lead to even greater risk to the United States. So, let me describe, as plainly as I can, what this action would be — and, just as importantly, what it would not be. The President has been clear about our purpose: these would be limited strikes to deter the Syrian regime from using chemical weapons and to degrade their ability to do so again. What do we mean by “limited?” This would not be the United States launching another “war.” As the President has said, repeatedly, this will not be Iraq or Afghanistan. There will be no American boots on the ground — period. Nor would it resemble Kosovo or Libya, which were sustained air campaigns. This will not be an open-ended effort. As the President has said, again repeatedly, this action would be deliberately limited in both time and scope. Nor would this be new. The United States has engaged in limited strikes multiple times before. Recall President Reagan conducted air strikes measured in hours against Libya in 1986. President Clinton conducted several days of cruise missile strikes against Iraq in 1998. No two military actions are identical. Each has its own costs and benefits. But these previous engagements are proof that the United States is fully capable of conducting limited, defined and proportional military actions without getting enmeshed in a drawn out conflict. What do we mean by “deterring and degrading” the regime’s chemical weapons capabilities? Strikes could target a range of potential regime capacities to manage, deliver, or develop chemical weapons. Assad would discover that, henceforth, chemical weapons offer no battlefield advantage relative to their cost to use. And, if Assad is so brazen as to use chemical weapons again, he would know that we possess the ability to further degrade his capabilities. Like many, I understand the public skepticism over using military force, particularly in this part of the world. The wars in Iraq and Afghanistan have left many Americans wary of further military action, however limited. But what the President is proposing is fundamentally different. Unlike Iraq, we are not betting on the existence of weapons of mass destruction. In Syria, we have the undeniable proof that chemical weapons have already been unleashed with horrific results. The entire world can see the bodies. True, there are always risks that accompany the use of military force. That is why we are taking a range of responsible measures to safeguard U.S. personnel and interests in the region, as well as those of our allies and partners. In this event, we do not assess that limited military strikes will unleash a spiral of unintended, escalatory reactions in the region. Assad and his allies would be more than foolish to take on the forces of the United States or our allies. They know that President Obama, throughout his presidency, has amply demonstrated he will not hesitate to defend our nation, our citizens, and our allies against direct threats to our security. The limited strikes that the President plans are necessary and appropriate, which is why they have garnered support on both sides of the political aisle. House and Senate leaders have declared their full support. Foreign policy experts from the left, right and center have strongly endorsed such action. There aren’t many non-partisan issues left in Washington. This is one — or at least it should be. President Obama has asked Congress for their support as the elected representatives of the American people, because he knows that investing the legislative branch in our policy choices helps ensure the maximum potency and sustainability of U.S. policy. This decision reflects the President’s profound respect for the power of our democracy and his belief that the American people care to defend our most basic values and live up to our leadership in the world. And he knows, like all Americans, that we are strongest in the world when we speak clearly and stand together. At the same time, the international community increasingly recognizes that this chemical weapons attack cannot be ignored. The Arab League foreign ministers have called for “deterrent and necessary measures.” The Organization of Islamic Cooperation has said the regime’s attack “requires a decisive action.” The NATO Council has met twice, and Secretary General Rasmussen has affirmed that the allies agree on the need for a “firm international response” to avoid chemical weapon attacks in the future. Last Friday, at the G-20 in St. Petersburg, there was unanimous agreement that chemical weapons had been used and that the international norm against their use must be upheld. We gained unequivocal public support for anticipated U.S. military action from partners in Europe, Asia, and the Middle East. Australia, Canada, France, Italy, Japan, South Korea, Saudi Arabia, Spain, Turkey, the United Kingdom, and the United States joined together in a strong statement declaring that the Assad regime is responsible for the attack and that “those who perpetrated these crimes must be held accountable.” In subsequent days, Germany, Lithuania, Latvia, Hungary, Croatia, Estonia, Denmark, Romania, and Qatar have signed on to that same statement, and we expect more countries to add their support. Over the weekend, European Union High Representative Catherine Ashton issued a statement on behalf of the European Union labeling the August 21 attack a “blatant violation of international law, a war crime, and a crime against humanity” and calling for a “clear and strong response” to ensure there is no impunity. Every day, more and more nations are coming to the same conclusion. With all the attention given to the prospect of limited military strikes against Syrian regime targets, I want to underscore that such action is by no means the sum total of our policy toward Syria. On the contrary, any such strikes would complement and reinforce our broader Syria strategy, which we continue to pursue with allies and partners. Thanks to the generosity of the American people, we lead the humanitarian effort to save lives, having provided the Syrian people more than $1 billion worth of food, shelter, medical assistance, clean water, and relief supplies. In fact, some of the medical supplies used to treat the victims at Ghouta came from the United States. We continue to upgrade and increase our support for moderate, vetted elements of the Syrian opposition in coordination with our international partners. We are building the capacity of local councils and helping civilian leaders to deliver essential services to those in need. We are helping the opposition better serve the needs of the Syrian people. And, we are expanding our assistance to the Supreme Military Council to strengthen its cohesion and its ability to defend against a repressive regime that kills civilians with abandon. Limited strikes that degrade Assad’s capacity to use chemical weapons, and thus to kill on a horrific scale with impunity, can also shake his confidence in the viability of his relentless pursuit of a military solution. But, ultimately, the only sustainable way to end the suffering in Syria is through a negotiated political solution, starting with the creation of a representative transitional authority that organizes elections and meets the needs of the Syrian people. A ceasefire and a political solution are also, as a practical matter, the only way to eliminate completely the Syrian chemical weapons threat. That is why we continue to increase pressure on the Assad regime to come to the table and negotiate. Notably, during our discussions in St. Petersburg, we sensed more urgency among key players to bring the parties to the negotiating table to jump-start a political transition. The United States shares that sense of urgency, and our intention is to renew our push for the UN-sponsored Geneva process following any limited strikes. Just as limited strikes would complement our broader Syria policy, so too would they reinforce our broader Middle East strategy. The United States will not take sides in sectarian struggles. We cannot and will not impose our will on the democratic development of other nations. But, as President Obama has made clear, we can – and we will – stand up for certain principles in this pivotal region. We seek a Middle East where citizens can enjoy their universal rights; live in dignity, freedom and prosperity; choose their own leaders and determine their own future, free from fear, violence, and intimidation. Standing up to the Syrian regime’s barbaric use of chemical weapons will affirm the most basic of principles: that nations cannot unleash the world’s most horrific weapons against innocent civilians, especially children. And failing to stand up to these weapons could impel the Arab Spring towards an ever darker and more ominous turn. Rather, we seek a Middle East where violent extremism, terrorism and weapons of mass destruction do not threaten our allies, partners and Americans. We seek the stability of a region that is vital to the energy that helps fuel our global economy. Countering Syria’s use of chemical weapons shows that the United States will act to prevent some of the worst weapons in human history from becoming the new norm. It will demonstrate that America means what we say. It will make clear to Assad and his allies — Hezbollah and Iran — that they should not test the resolve of the United States of America. This has implications for our efforts to prevent a nuclear-armed Iran. The policy of the United States is clear: we will not allow Iran to acquire a nuclear weapon. With allies and partners, we continue to pursue a comprehensive strategy to prevent Iran from obtaining a nuclear weapon, including diplomacy, pressure, and increasing sanctions. And, as the President has said, all options remain on the table. For our efforts to succeed, however, the leaders in Tehran must know that the United States means what we say. If we do not respond when Iran’s close ally, Syria, uses weapons of mass destruction, what message does that send to Iran? It risks suggesting that the international community cannot muster the will to act when necessary. It risks suggesting that serious threats to regional and global stability will be left to fester. It risks suggesting that egregious violations of international norms do not have consequences. Make no mistake, the decision our nation makes in the coming days is being watched in capitals around the world, especially in Tehran and Pyongyang. They are watching to see whether the United States will stand up for the world we’re trying to build for our children and future generations. And, if we fail to act, they will be emboldened to push harder for the world that only they want — a future where more of the world’s most dangerous weapons fall into the most dangerous hands. That is not the Middle East or the world that we seek. On the contrary, we seek a Middle East where Israelis and Palestinians live in two states, side by side, in peace and security. Yet, Assad’s indiscriminate use of chemical weapons increases the possibility that they could someday be used against Israel and Palestinians. This only heightens the sense of vulnerability many in Israel feel about the turmoil that engulfs their nation, and it might make it even harder for Israelis and Palestinians to take the risks for peace. The bottom line is that standing up to Syria’s use of chemical weapons advances our broader goals in the Middle East. Conversely, by allowing Assad to act with impunity, everything else becomes even harder — from countering terrorism to defending human rights, from promoting peace to ensuring our energy security and preventing the proliferation of weapons of mass destruction. In closing, allow me to speak, not just as the President’s national security advisor, but also as a parent, a mother. Time and again, we have seen what happens when the world fails to respond to horrific abuses on the scale we saw in Damascus. We’ve seen the even greater barbarism that can follow, whether in Srebrenica or Rwanda or Darfur. I’ve been to more than my share of war zones. Each is horrible and uniquely tragic. But this most recent atrocity is particularly gut-wrenching. And unlike those tragedies of earlier decades, we have the technology — on our computers and our smart phones — to see the full horrors unfold in real time. Children lined up in shrouds, their voices forever silenced. Devastated mothers and fathers kissing their children goodbye, some pulling the white sheet up tight around their beautiful faces, as if tucking them in for the last time. There are no words of condemnation strong enough to capture such infinite cruelty. But where words may fail us, action must not. Every adult American, every Member of Congress, should watch those videos for themselves. See that suffering. Look at the eyes of those men and women, those babies — and dare to turn away and forsake them. Watch those videos, and imagine the months and years ahead where an emboldened Assad and those who follow his example carry out more attacks, forcing us to witness more and more such depravity. I believe you will come to the same conclusion as the President and so many countries around the world: that this cannot stand. Not in the 21st century. Not given the values and principles that we as Americans hold dear. As the one indispensable leader in the world, the United States of America can and must take action — carefully, responsibly, purposefully — to reduce the chances of such an outrage happening again. 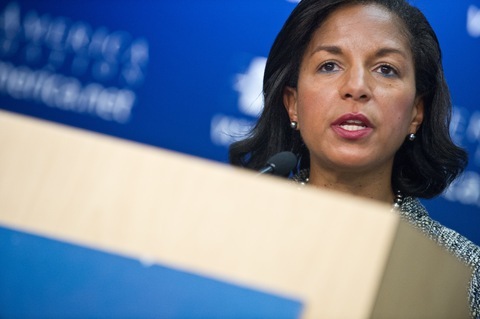 Remarks as prepared for delivery by National Security Advisor Susan Rice, released by the White House.